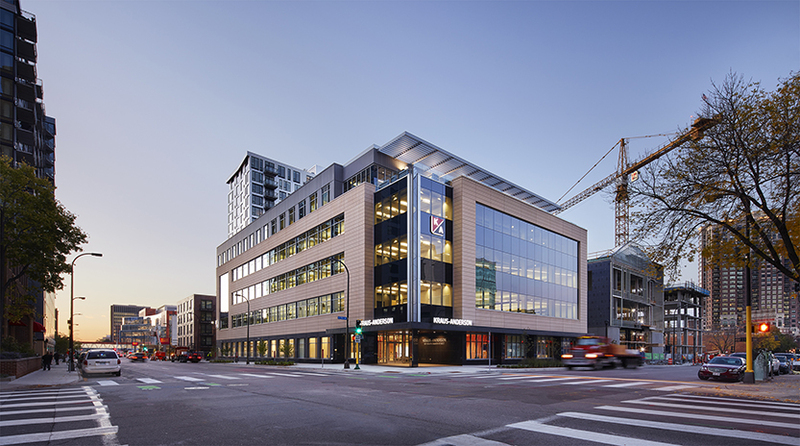 When Kraus-Anderson began the development process for its new corporate headquarters building in downtown Minneapolis, company leadership determined the guiding principle used throughout the project would be “cost-effective sustainability.” This principle has influenced all decision-making with regard to space planning for customers and employees; building components, systems, and technology; and construction means and methods. As a result, the building is on track to achieve LEED certification for sustainability. KA’s Mechanical & Electrical Systems Manager Matt Stringfellow, recently walked us through some of the features and considerations behind this initiative. Q: How does the new KA headquarters contribute sustainability to downtown Minneapolis? MATT STRINGFELLOW: The new headquarters building is incorporated into a block-wide development that includes high-rise housing , a boutique hotel, and a non-profit micro-brewery. These diverse facilities on the block fit together in a manner to create a unique urban experience within the heart of downtown that taken as a whole represent a great sustainable addition to the city of Minneapolis. Q: How does the first floor and its amenities support sustainability? MATT STRINGFELLOW: All of the first floor spaces are arranged in a layout that easily flows from one area to the next. An employee café with large windows sits in the southwest corner to capture ample daylight. The café includes kitchen facilities for employees who bring food from home as well as a self-serve market with healthy food options. The café can also be used for overflow collaboration work space during the business day. Adjacent to the café is KA University, a multi-purpose training/conference room for both in-house functions and visitor events. A pre-function break-out space containing a service bar sits just outside the training room. A separate catering kitchen for special events is located between the café and multi-purpose room. The first floor also includes the employee fitness center and locker room facilities. Q: How does the building design balance collaborative spaces with those promoting privacy and individual focus? 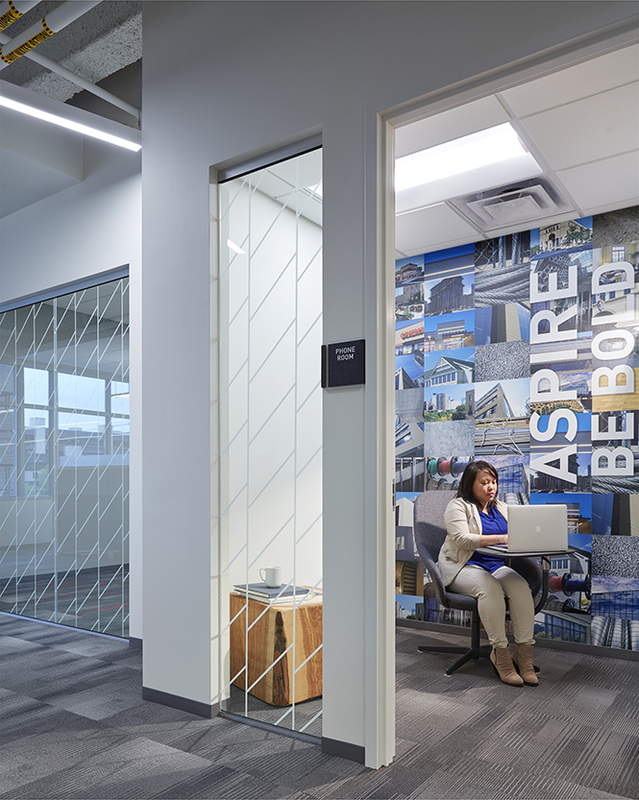 An open office concept is used throughout the building with collaboration conference rooms, smaller private phone rooms, and specialty workrooms located in the central core of the building. Systems furniture workstations are located throughout the building perimeter areas with a circulation pathway maintained between the workstations and the building exterior wall so that there are no dead end circulation areas. 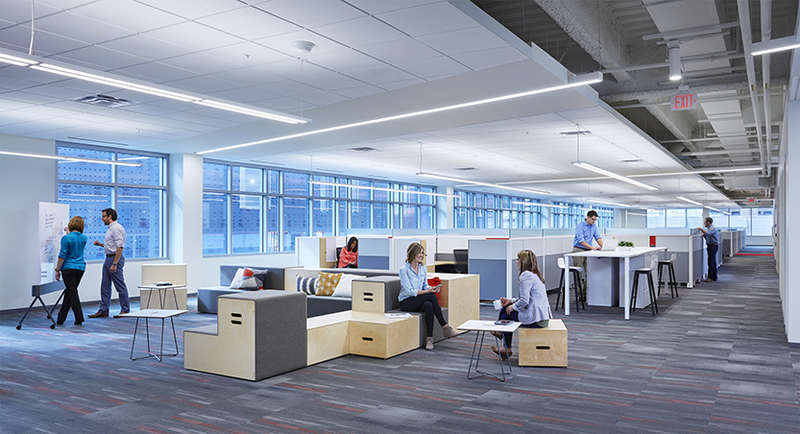 Lower partition heights in the workstations help facilitate collaboration among the employees and also allow daylight to penetrate further in toward the center of the building. Another important feature of the workstations is the incorporation of electrically operated desk height adjustment that allows employees to easily change from sitting to standing multiple times a day as they so desire. Open collaboration/lounge areas with comfortable seating and coffee station services are strategically located on each floor. Q: How is vertical circulation promoted throughout the building? MATT STRINGFELLOW: In addition to the elevators, the two emergency exit stairwells are designed to be used by employees for vertical circulation during the business day. A monumental open stairway connects floors 3 and 4, which house the construction company project managers. 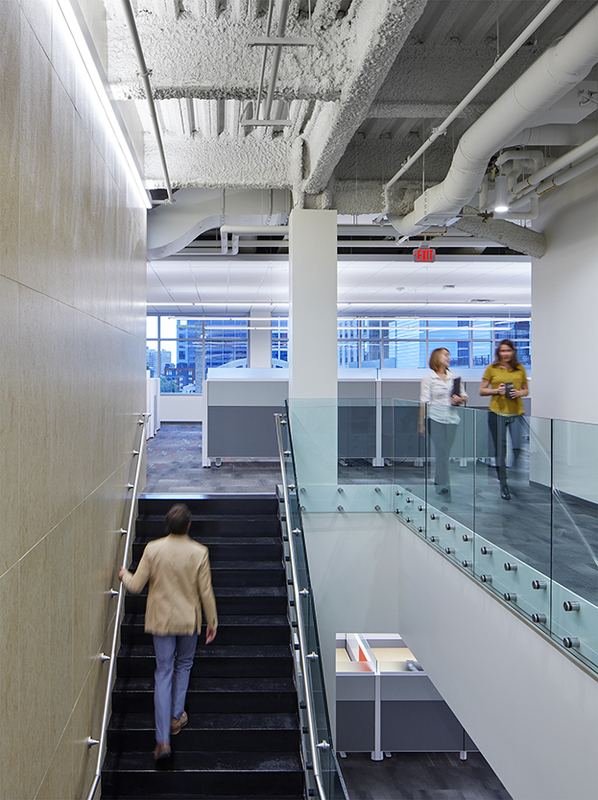 The open stairway was added to facilitate increased connectivity and collaboration among this group of employees. A signature conference room located in the northwest corner of the building is replicated on floors 2, 3, and 4. A large outdoor patio is located on the west end of the 5th floor complete with gas grill and fantastic views of the city. Q: With all those windows, how does the building balance temperature control and energy efficiency? MATT STRINGFELLOW: The windows for a majority of the building use both continuous ribbon-glass configuration as well glass curtain wall system to afford maximum daylight. The window glass tint color provides an effective balance between limiting the solar heat gain which reduces the air conditioning load (as with darker glass color) and yet still allows an effective amount of daylight to enter the building to reduce the electrical lighting requirement (as with lighter glass color). The window glass tint color also works to limit solar glare which improves comfort by reducing eye strain. Q: Employees have remarked on the excellent air quality of the building. What factors into the indoor air quality? MATT STRINGFELLOW: All interior finishes for flooring/carpeting materials, wood wall panels, and paints/adhesives were chosen for their low off-gas emitting characteristics to improve indoor air quality. An indoor air quality management plan was also maintained during the construction period to help reduce indoor air pollutants resulting from construction activities. Q: What are some of the highlights of the mechanical systems? MATT STRINGFELLOW: The mechanical and electrical systems provide a high degree of indoor comfort in an energy efficient manner. The mechanical units that provide fresh air ventilation and air conditioning to the spaces consist of 2 identical package rooftop variable air volume air handling units with direct expansion cooling and natural gas fired preheating. This is typically considered to be an economical solution from an initial cost perspective. The energy efficiency is increased by including a “spray evaporative condensing” feature to the cooling system in each air handling unit. 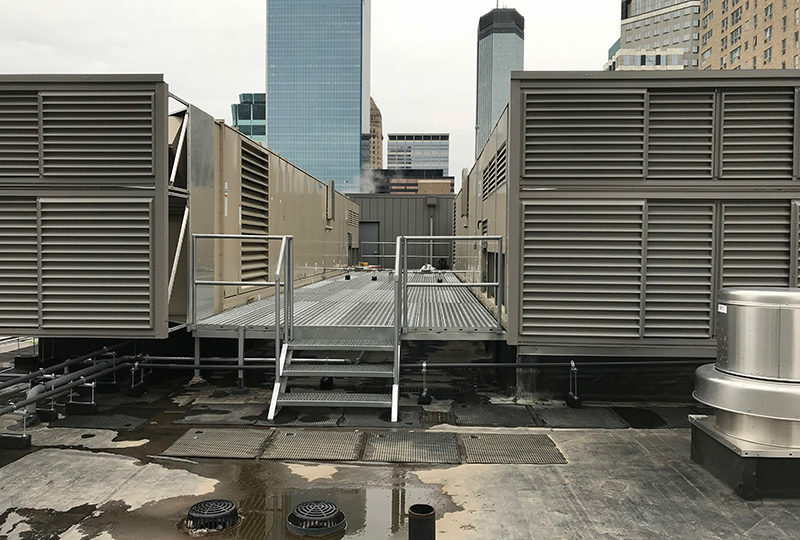 Maintenance access is improved by strategically locating the air handling units on the roof with a single raised extra-wide catwalk in between the 2 units which provides generous access and service area for each air handling unit. A decorative screen wall system surrounds the air handling units to conceal the units and cause them to blend seamlessly into the building architecture. The screen wall was cleverly designed to attach structurally to the air handling units themselves rather than the building roof structure which saved on cost and materials. The main building heating system consists of two high efficiency condensing natural gas fired hot water boilers. The heating hot water is circulated throughout the building using two variable speed pumps. The main air delivery system for the building consists of ducted supply air system with variable air volume/hot water reheat control and plenum return air. Temperature control and equipment monitoring is provided by a networked direct digital control system. The electrical lighting consists of direct/indirect and pendant style energy efficient LED light fixtures. Continuous linear lensed strip LED light fixtures are used in a diagonal pattern throughout the building at strategic locations to add unique architectural interest. Daylight harvesting controls are used to save energy for the lighting by automatically reducing the light level output when sufficient daylight is available through the building windows. A natural gas emergency generator located on the building roof will provide backup power for the life safety systems and some equipment loads. Data connectivity is provided by both hard-wired data jacks and wireless access points throughout the building. The audio visual systems in all conference rooms and areas of the building use identical touch pad interface control for simplicity and ease of use by employees. Other sustainability features pertain to the overall city block development project. The entire city block has 2 levels of underground parking below the buildings above. The underground parking structural system was constructed in a unique way that reduced the amount of construction materials needed. As with many underground foundation systems in an urban center, a corrugated steel shoring system was first installed around the perimeter of the block to hold back the earth in adjacent areas and thereby facilitate excavation of the underground space. Typically a concrete foundation wall is poured around the perimeter of the excavation and then afterward the temporary shoring is removed. 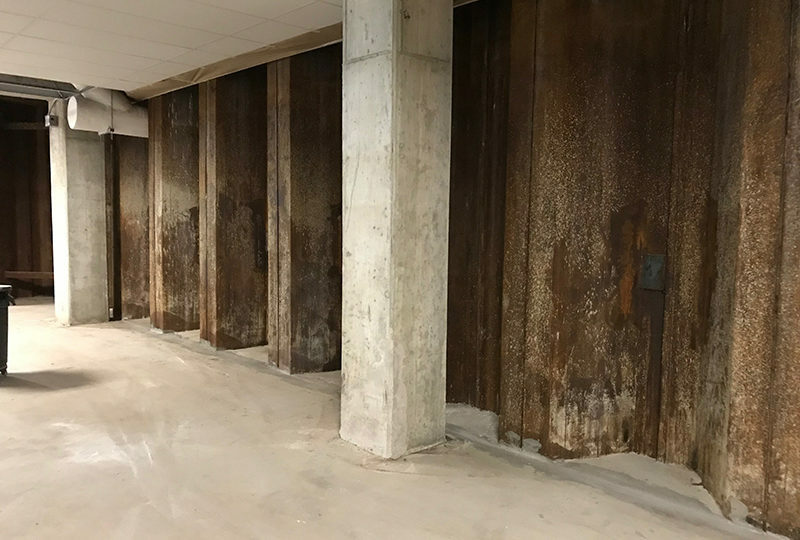 However, in the case of the KA Block, the concrete foundation wall was eliminated all-together and the corrugated steel shoring was left in place and exposed to form the finished walls of the underground parking ramp structure, resulting in significant cost savings. The KA Block development has many sustainable features related to the overall project site. The storm water for the site is managed using an underground treatment and detention vault installed on the project site between the parking ramp and the street on both the east and west sides of the site. The project location is in close proximity to public transportation with regular scheduled bus and light rail routes a couple of blocks away. Bicycle racks are installed in the underground parking ramp for use by bicycle commuters. The project site contributes positively to development density and community connectivity with multiple business, residential and retail services a short walk away. The center of the block contains a drive through lane in between the buildings to provide safe and convenient off-street passenger drop-off areas for both the apartment building and the hotel. The center of the block also contains a beer-garden which will become another great downtown outdoor gathering spot. Congratulations on a great looking and high performance building! !